Electromagnetic fields are used by marine organisms for several purposes, from navigation to communication to predation. One potential biological threat of installing energy-generating technologies is that the fields will disrupt the behaviors of marine organisms. Electromagnetic fields are created when electricity is transported. Currently, there is a debate about whether AC or DC cables to offshore energy generating technologies would be best. For this reason, the environmental impacts of both technologies are important to understand. The Earth generates its own baseline magnetic field which has a strength of 25-60 μT. In comparison, most people are exposed to magnetic fields that are 2000 times stronger on a daily basis (NaiKun 2009). Marine organisms, however, are far more sensitive than people to magnetic indicators because they are not able to rely on vision as well as land animals. Every year, researchers discover new details about how that marine organisms use the Earth’s magnetic field. Man-made technologies can interfere with marine animals’ information gathering processes. 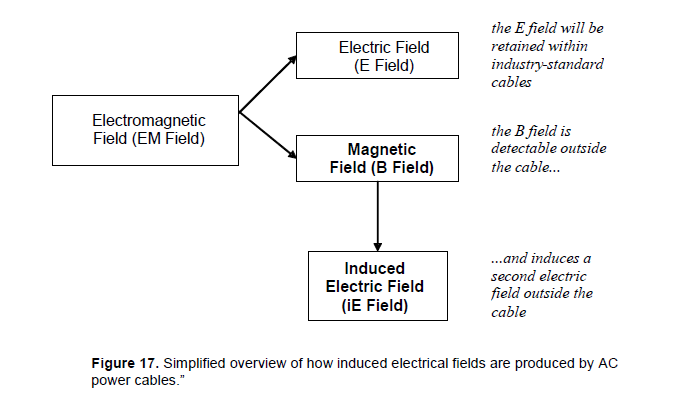 Both AC and DC transmission cables create magnetic fields. While DC cables create a magnetic field that depends on the amount of current transmitted, AC cables create an oscillating magnetic field. 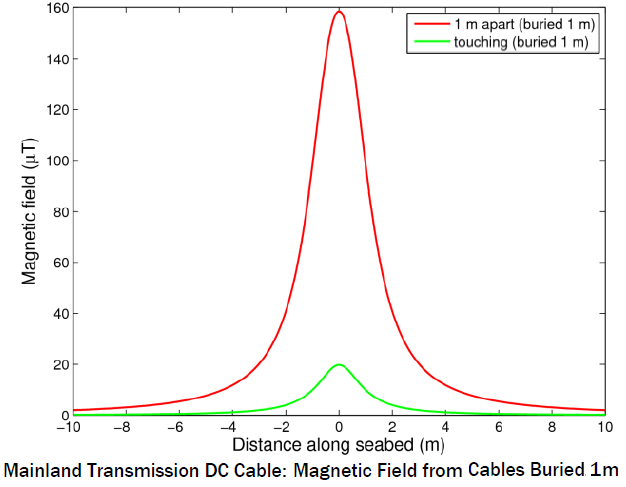 The magnetic field created by DC cables increases dramatically with the distance between the bipolar cables. Burying the cables can significantly reduce the field strength. By themselves, electric fields are not created by underwater transmission cables because of the grounded metal wire sheath. 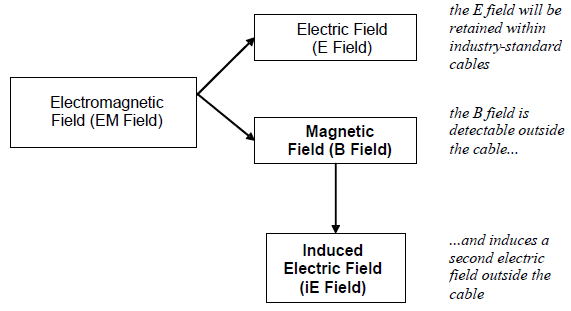 However, an electric field is induced when marine organisms move through the magnetic fields created by the current. The strength of these fields is usually really small (on the order of 20 to 40μV/m). Certain species, particularly elasmobranchs, are able to detect these induced electric fields (Gill 2009). 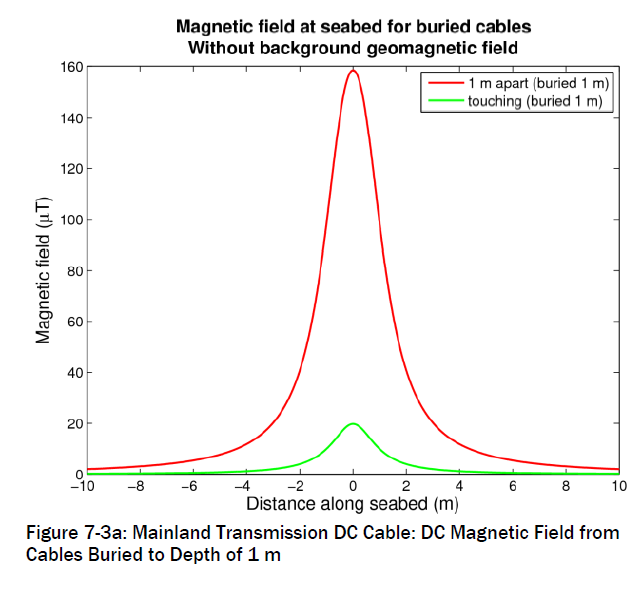 In general, these induced fields are greater for DC submarine transmission cables than for AC cables.